Nature’s best healing goodies in this delicious hamper to show your caring thoughts. Yogood Blissful Blueberry & Cranberry Muesli 360g and an orchard-fresh pack of freshly picked fruits presented with cheery Gerberas flowers. At least 5 types of hand-picked varieties of juicy fruits to be savoured. As only the freshest fruits and flowers are used for all our fruit arrangements, the types of fruits and seasonal flowers may be subjected to change. Same day delivery applies for order made before 12pm on a working day. For out of Klang Valley, Malaysia delivery, gift accessories displayed are subject to change. Call Giftlab at 03-78830233 / +6012-6915200 or email us at sales@gift-lab.com for assistance. 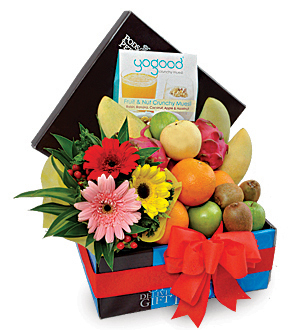 Fruits gift are ideal as a Get Well Gift, for new Mother or as a 'Thank You' Gift.